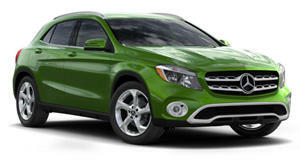 This rebadged Mercedes has a lot of cool features. We recently spent a week driving the 2017 Infiniti QX30 Sport. This little SUV may have its foibles, but it's one of the best crossovers for offering a fun driving experience. Our tester was devoid of several optional extras like driver assist technology or built-in navigation. While not a tech-lovers car, the QX30 did have a few unique features that enthusiasts may like. 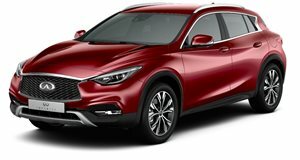 Infiniti clearly focused on making the QX30 Sport appeal to enthusiasts, so we compiled our five favorite things that we liked about this little crossover. Unique Styling The Infiniti QX30 is unapologetically a rebadged Mercedes GLA 250, but we actually prefer the styling of the QX30. Our QX30 Sport had a lower ride height than a standard model, which made it look more like a hatchback than a true SUV. We've always felt a bit annoyed that Mercedes never sold the A-Class hatchback in the US, and the QX30 Sport is actually the best looking car built on this platform that's sold in the US. The grey wheels on the Sport really complete the look and the seats are even taken from the more powerful GLA 45 AMG. Around View Monitor Our QX30 tester may have lacked certain optional tech features, but it did have Nissan's excellent around view monitor. This system uses several cameras that are placed around the car to offer a top-down, bird's eye view when parking the QX30. Parking a car with this system is easy, and belongs on any luxury car. A standard backup camera is a nice feature, but we think that all luxury models should have a system like this. Cars are becoming harder to see out of because of safety standards and coupe-like styling, but systems like this make it much easier to park and drive cars with poor visibility. Mercedes Keyless Entry One of the things that the QX30 shares with its Mercedes counterpart is its key. The QX30 is the only Infiniti to use a Mercedes key, and the emergency key portion of it even has a Mercedes logo on it. We really like the metallic start button that Mercedes uses and the fact that the button is removable. Anyone who has gone on a test drive of a Mercedes may know that the key fob can be used to start the car normally. The push-button starter can be removed and the key can be inserted into a slot and twisted to start the car. It may be a bit silly, but we like the ability to have both push-button and a standard ignition in a car. Usable Power And Torque The QX30 uses the same 2.0-liter turbocharged four-cylinder found in the CLA and GLA 250. This engine produces 208 hp and 258 lb-ft of torque. This power goes out to FWD or AWD through a seven-speed dual-clutch transmission. It may not sound like a massive amount, but we loved the way that the QX30 deployed its power. On the highway, this car has tremendous overtaking power that's smooth and usable. This engine is capable of going from 40 to 60 mph while barely exceeding 2,000 rpm. It isn't a speed demon, but this SUV has very usable power and torque. Value One of the best things about the QX30 is its value. The QX30 starts at just $29,950, which is around $3,000 less than a base GLA. We think that the QX30 represents a great value for its price given that it's less expensive than even a base CLA or Audi A3. For buyers looking to get into a luxury car at the lowest price, this rebadged German car is by far the best-priced option on the market. The base QX30 is pretty bare, even coming with cloth seats as standard. Still, base models will be hard to come by and the QX30 has very good lease deals that make it appealing for many buyers.